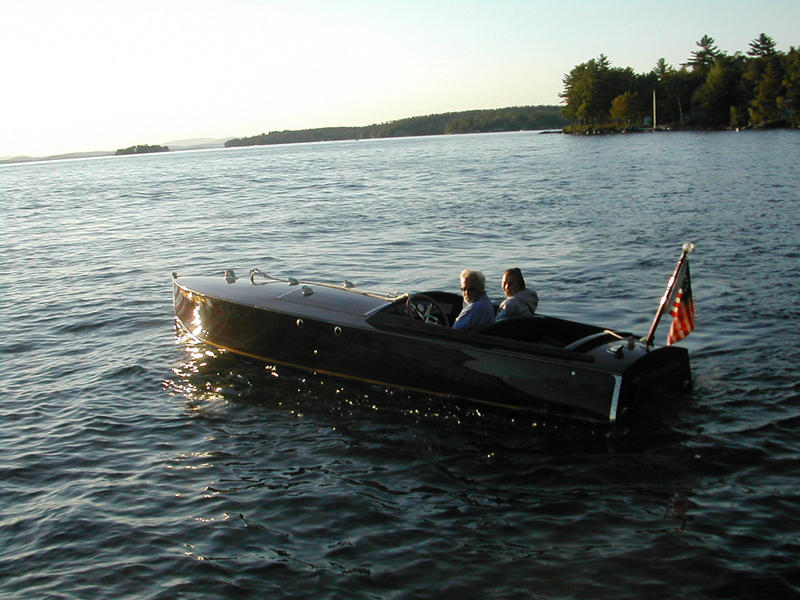 Hailing from New Bedford, MA, William Hand was a prominent Naval Architect of his time and known primarily for his wonderful motor-sailors which were built between the 1930's and 1950's. Prior to this era, he was famous for his development of the V-bottom planing hull, of which Winnwood is a fine example. Built in Alton Bay, NH and used as a Racing Launch in the early 1920's, this boat was later retired for use as a family pleasure boat and is thus still used to this day. The first engine used in the boat was reported to be a Scripps 80 H.P. The second engine was a 1927 Whippet 40 H.P. car engine. The current power plant is a 1960 Chevy Chris-Craft 283 V-8 which runs at 210 H.P. Winnwood has been totally restored over the years by Phil Spencer, with a new exterior skin of Honduras mahogany and a triple layer composite bottom. The internal framework is mostly original. Some of the brass and bronze hardware has been gold-plated to reduce maintenance. A delight to drive, this boat is used almost daily during the season! This boat turns heads wherever she goes. A super fun boat with a great ride to boot. Complete with custom single axle trailer and brand new mooring cover. $75,000. This is the Bugatti of the wooden boat world. .